Charlene Storozuk is in the business of adding a "WOW factor" to a home. 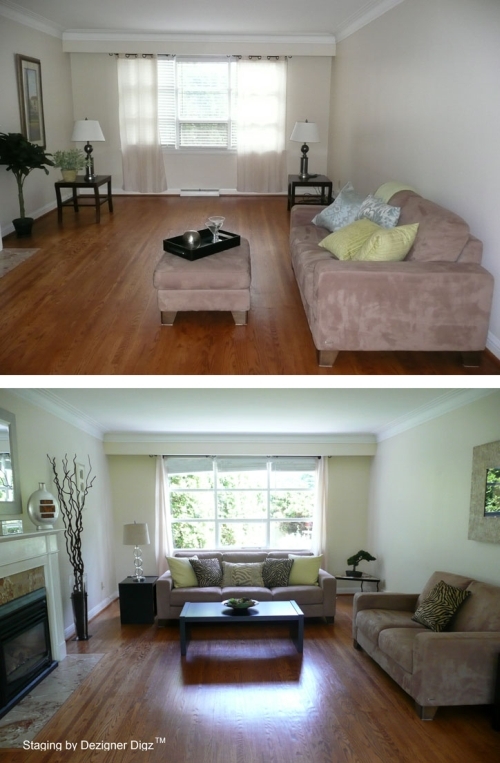 A home stager, color consultant and feng shui designer - now that's what I call a winning combination! Charlene has some really impressive qualifications, but instead of listing them here, I'd rather let her work speak for her - because, as they say, the proof is in the pudding. 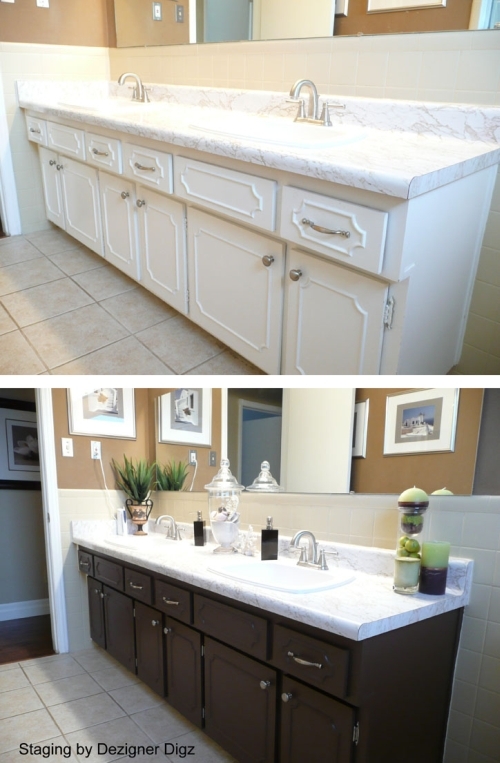 So take a look at the before and after transformations, and prepare to be WOWed! Charlene, can you share a few key things about yourself, and what led you to pursue a career in home staging? I have a background in human resources and prior to that in law as a Legal Assistant. Both of these careers have been very helpful in getting my business off the ground. From a very early age, I had a love for decorating and design. In fact, my parents never knew what my bedroom would look like. I was constantly re-arranging the furniture and adding little knickknacks to change it up. Over the years, I moved several times and although I wasn’t keen on the moving process, I did enjoy the challenge of preparing my homes for sale. 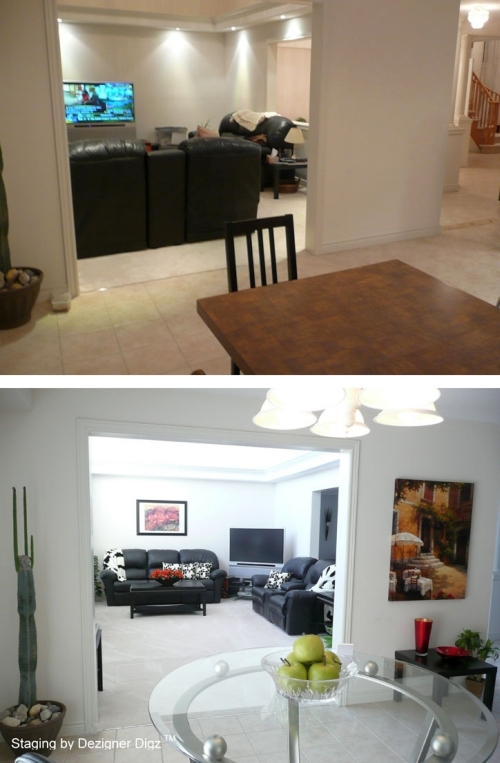 My interest in home staging grew from there as I saw the rewards of my work. 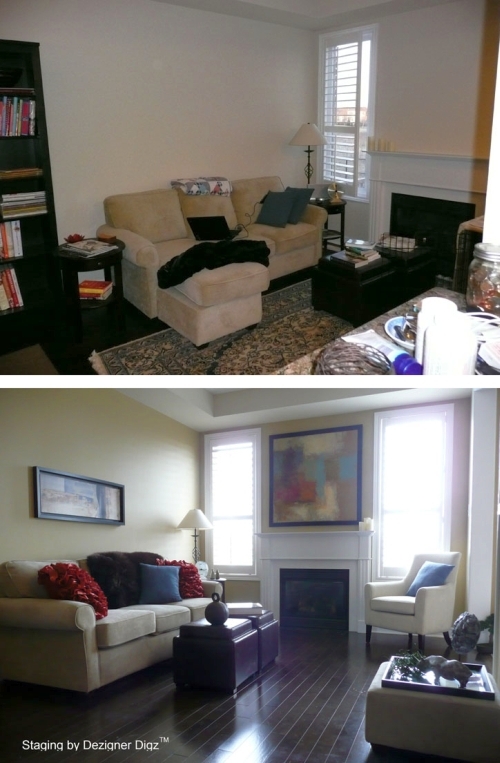 Starting a career in home staging seemed to be the next logical progression for me. There’s nothing better than doing what you love! What exactly is home staging, and what's the point of it? Home staging is the art of preparing a property for sale in a manner that will appeal to the broadest range of potential buyers. It’s more than just de-cluttering and de-personalizing, which the homeowner can do themselves. Home staging can include furniture re-arrangement, painting and other home improvements that will help bring the most return on the owner’s investment. A staged home will sell faster and in some cases, for more money than a home that has not been staged. 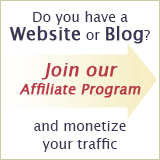 How do you know what a potential buyer is looking for? Due to today’s fast-paced lifestyle, many potential buyers want a “move-in ready” home. They don’t have time for redecorating and don’t want the inconvenience of living in their new home through renovations. There are certain features that are in high demand; one is granite countertops. Along with that, prospective buyers want a well designed, spacious kitchen. Hardwood is of course another popular item. A large master bedroom with an ensuite soaker tub is also high on the wish list. I just read in a recent survey that people want space in their new home for a home office since telecommuting is becoming a popular trend. What are the most common mistakes you see homeowners make when trying to sell their homes? 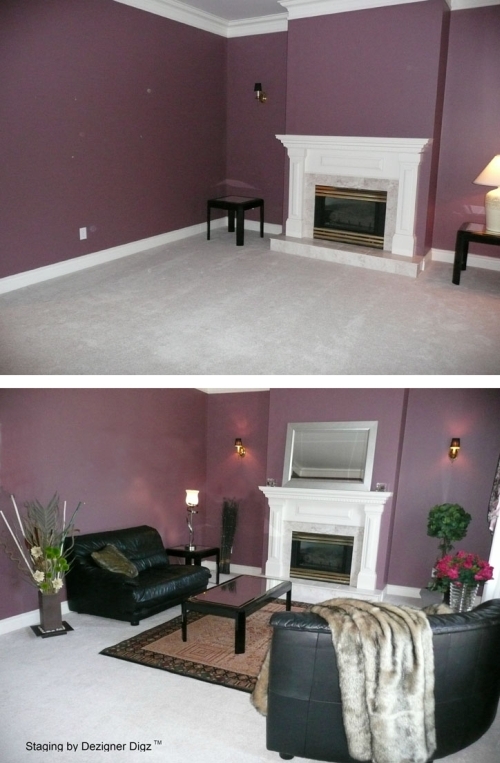 I would say the number one mistake is not replacing worn, bold-coloured carpeting. Some homeowners feel that they would rather reduce their listing price or give a carpet allowance to allow the new owner to choose for themselves. I’ve seen many a home languish on the market because of this. Another mistake that I see is people leaving their homes empty. Studies have proven that a vacant home will be on the market longer than one that is set up with furniture and accessories. 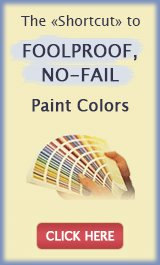 Is it true that only neutral paint color sells? No, that’s not true, but there is a fine line between what’s acceptable and what isn’t when selling your home. If the colours in a home are too far from neutral, some people will be put off. However, boring beige is just that – boring and the same goes for white. Some homeowners that I have met with have painted their homes white before selling, because they felt that it would be more appealing. This makes it more of a challenge to give their property that sought after ‘Wow Factor’. One way to introduce some interest is to add a feature wall with a splash of colour like the wall behind the fireplace in the picture below. How can people make their homes more appealing at open houses? Easy listening music such as light jazz and fresh flowers are two of my favourite tips for open houses. If it’s a beautiful sunny day, make sure the patio or deck is set up with outdoor furniture and have the cushions in place. As well, home owners should take their pets with them when they leave for the open house. If a potential buyer is afraid of dogs, he or she won’t stick around too long. 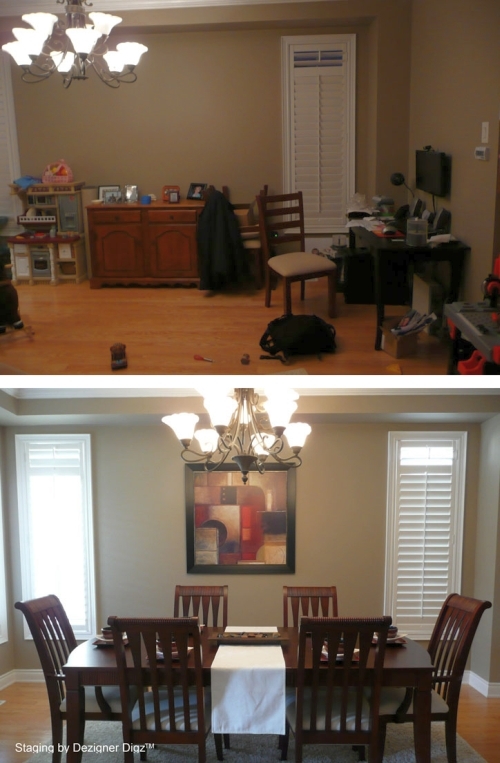 Can home staging help disguise dated tile/countertops/carpet and how? Accessorizing can help to draw the eye away from unsightly objects. For example, if your broadloom is pumpkin orange and you absolutely cannot afford to replace it, a neutral area rug placed over a portion of the broadloom will help to tone it down. This should never be done though if the broadloom underneath is worn or stained. You don’t want to disguise flaws – that’s unethical. 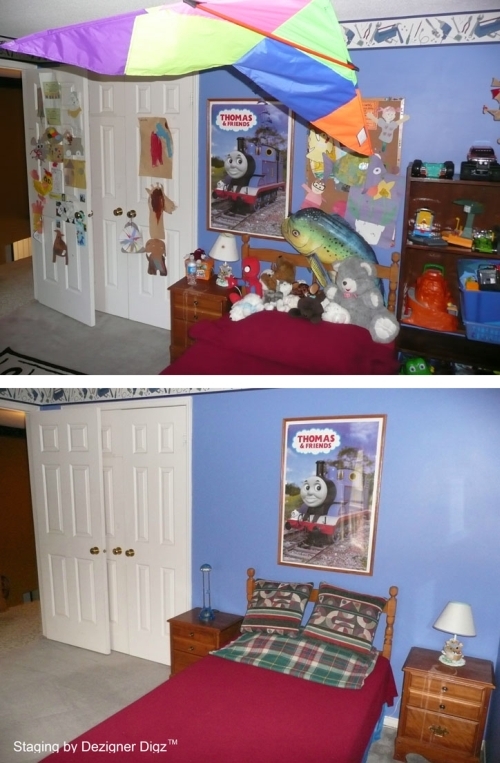 You’ll see in the photos below what can be done to freshen up a room at minimal cost. Although you can’t see it in the ‘before’ photo, the tiles in this washroom were originally pink before this photo was taken. They were re-painted to a more neutral sandy brown colour. As well, the cupboards were painted chocolate brown to make them more current. 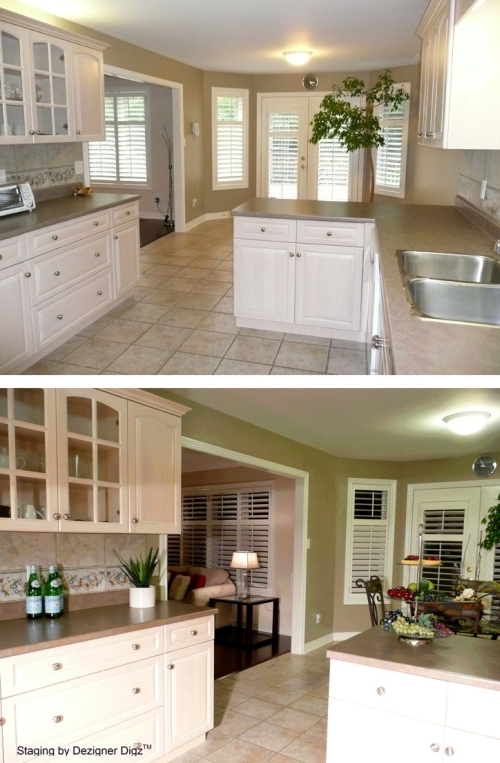 By changing the colour of the cupboards and the tile, the countertop became more appealing. 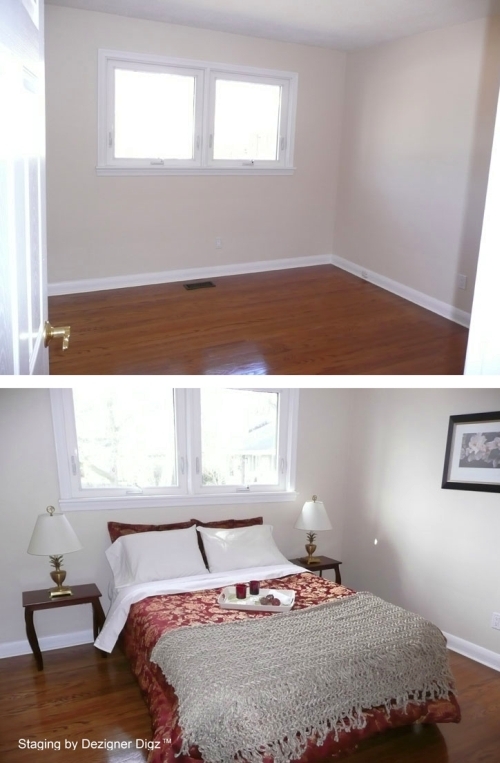 Is there anything that even homestaging can't help with? If a homeowner is not willing to address issues such as extensive clutter, dirt, or odours, then no amount of home staging is going to help. Can feng shui help sell a home faster? Any tips? Many of the principles of Feng Shui are similar to the principles of good design. If a room flows properly, it gives off good Ch’i. That same flow is imperative when you are home staging to make each room appear larger and create an easier transition from room to room. In Feng Shui, a home is divided into different sections through the use of a Bagua Map. The wealth and prosperity area of your home can be enhanced to help bring more money from the sale. A Feng Shui professional will locate this area for you and provide tips on how to enhance it with items such as purple accessories. 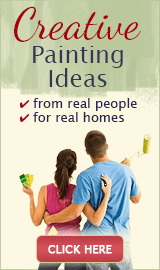 What if the homeowner isn't happy with the way his/her house has been staged? 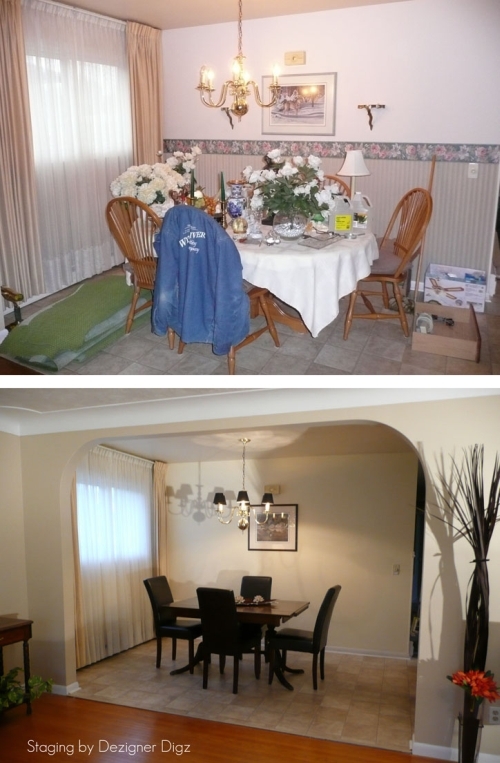 I’ve been fortunate that my clients have been very happy with the outcome of their homes. I did have one client voice concern about the placement of his television. Once his furniture was re-arranged, it wasn’t as convenient for him to watch it and be comfortable at the same time. After explaining to him the reason for that specific placement, he was totally okay with it. At the end of the day, if you are serious about selling your home, you have to make some sacrifices. How you live in your home becomes very different when you are trying to sell it. It’s more important that the property appeal to the greatest number of potential buyers than to the homeowner’s personal tastes. Hard work, word of mouth, never giving up on your dreams and most of all, an incredibly supportive husband. 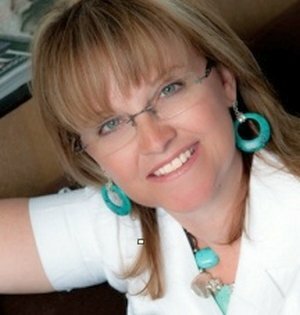 If you would like to set your home up for a faster sale (especially in this market), contact Charlene at www.DezignerDigz.com - her company is located in Burlington, Ontario. Charlene also offers helps with color and design consultations for DIY homeowners who are not planning to move any time soon. Designer and feng shui expert in one? Charlene must be really good. I mean to know a lot about designing a home and feng shui is a great combination and very convenient for those who decide to hire her.